Mount Bromo midnight tour from Surabaya, Malang, Banyuwangi is the simple vacation by private included the picking up from your location requests like Hotel, Train Station, Bus Station, and Airport. Bromo midnight trip also is known as Mount Bromo tour 1 Night 1 Day known as the most simple trip because You don't need to stay in Hotel around Cemoro Lawang. Bromo tour midnight from Surabaya or Malang start at 21.00 - 23.00 PM. If You want to enjoy midnight trip from Banyuwangi, You must start your trip at 20.00 PM. 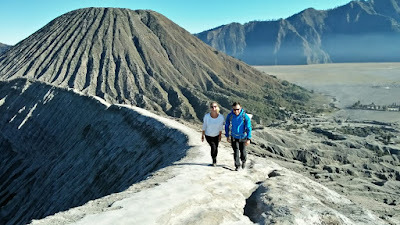 We provided this trip for all tourist to explore Mt Bromo sunrise from the highest peak, Massive Sea of Sand and crater. If You want to see the Mount Bromo Milky Way, You can begin your trip from Surabaya or Malang at 07.00 PM. Mount Bromo tour midnight start at 22.00 - 23.00 PM, Our driver will meet You at your location around Surabaya, Malang, Banyuwangi. then accompanied to the Jeep parking around Ngadisari Cemoro Lawang. 05.20 AM, Enjoy the sunrise, Continue taking pictures for other landscape like Wide Sea of Sand and Mt Batok. From Pananjakan peak, You will also able see the highest volcano usually climb by most foreigners namely Semeru volcano summit. If You want to try Semeru volcano hiking, You can choose on April - November. 09.00 AM, Finish the amazing crater, If you have more time, You can continue to Savannah and Whispering Sand. But If You don't have more time, Just Continue to the restaurant around Cemoro Lawang to have breakfast and enough break. Comeback to your location request and finish Bromo midnight trip from Surabaya, Malang, Banyuwangi. Before You begin Mt Bromo midnight package from Surabaya, Malang, Banyuwangi, We suggest You can bring Jacket, Gloves, Hat Trekking Shoes, and Long Pants in order You able make adaptation with cold temperatures and trekking condition. For more information about Mount Bromo tour package and facility, You can visit Our Contact.